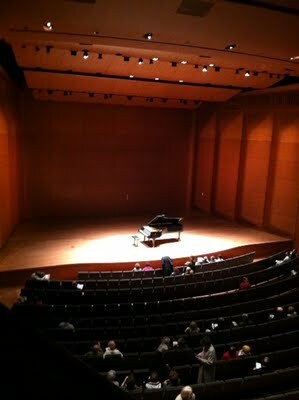 I just came from Lincoln Center where I saw a piano recital. I know most people would find that to be a big bore-fest of an evening but that stuff feeds my needs. The program included Bach’s Tocatta and the beautiful Six Moments Musicaux by Rachmaninoff. The pianist was Xiayin Wang and, oh Sweet Mother of Jesus, what a performance! Do you realize the level of musicianship someone needs to attain in order to play at Alice Tully Hall? It takes a superhuman, almost mystical capability. You have to be, quite literally, among the best in the world. They completed a major renovation of Alice Tully Hall just two years ago. The concert hall itself is a work of art. It’s all soft angles and perfect acoustics and warm wood and full sound. And it’s super-comfortable, to boot. I was sitting on the side balcony, which is the perfect view to watch her fingers dance across the keyboard. The intervening slow passage raises questions of its own in its harmonic circling, and has to deal with an early crisis in the form of an extraordinary diminished-seventh tremulation. Gpungh elwengh crothzen leumbh geewee goygoy fungsell weveweve neng. Yeah, vermin proof if the lid is on. 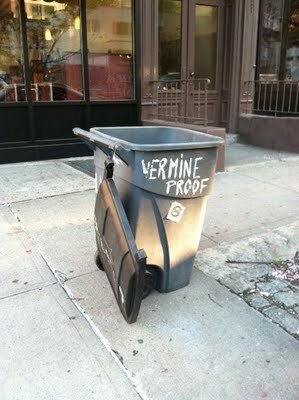 What kind of twisted city ordinance requires that the garbage bins that are vermin proof need to be labeled as such? Vermin can’t read. I like the lettering. It looks like the cover of a death-metal CD. I am happy to report that I saw this near the Trump Soho Hotel. Make of that what you will. It looks like someone mushed his little head. They call these “water bugs” but that just a pleasant name for a BIG cockroach. I should have put a coin next to him to give you a sense of scale. He’s a bit larger than your thumb. New York. You gotta take the world-class pianists with the vermin. Maybe the same people write the Lincoln Center blurbs and the trash can notes! I can’t read music;I just try to remember where to put my fingers.And the Soho bin? Maybe someone tried to stuff Big Donald into it. 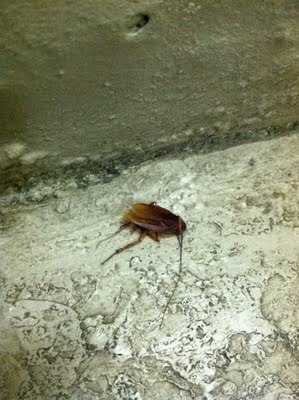 that’s “ver-MINE” dear… far more upscale than vermin…in florida they call giantass flying cockroaches “Palmetto Bugs”. they are large enough to carry air-to-surface missiles. Oh my god. I saw SO MANY cockroaches while I was travelling. Screaming horrible things. Impossible to kill. Scuttling.I remember sharing a shower with one in one hostel. Couldn’t move it and it wouldn’t fit down the plug. Eurgh. Jo: My two Siamese cats helped keep them at bay. They thought I brought them in as toys.nurse: Thanks. It was a happy accident. I’ll take the pianists please.Just think – according tot the sign writer there’s only one letter between vermine and ermine.I always said mink were vermin. We’re dealing with the 17-year cicadas down here. They come out of the ground, shed their shells, grow new ones, fly into your hair, mate and then go back underground for another 17 years. In the meantimes, they make more racket than a jet engine and leaf blower combined. They just started hatching and will be here for a month. Thank goodness I’ll be gone for a chunk of that time. Lol to Pat’s comment!Alice Tully Hall is truly one of my favorite places in the city. Some of the most epiphanic/magical moments of my life happened in that space.